You’ll have to forgive me, it’s literally been almost a year since I last posted on here. Really, I post mostly for my own ability to find good recipes we’ve had when I am scrambling for dinner ideas at 5:05pm on a weekday after work. So maybe I will apologize to myself. I have a lot of great recipes we’ve discovered this past year that need to find their way on to this site. I am hoping to play some serious catch up. My second apology is for some of the pictures I am going to post (i.e. the one for this recipe) as the sun sets at like 4:30 these days, so lovely, naturally lit pictures are out until the next time change. Oh well. This recipe is one I found in my real simple magazine after we spent New Year’s Eve cleaning out our pantry (no lie, it was 10pm and being the crazy party animals we are, we were chucking half our pantry to rid ourselves of expired and unhealthy items). Hidden in the depths of the third shelf was a glorious stash of quinoa that I had no idea was back there, so I have been using the opportunity to try out new recipes using what we already have. This was a really simple, delicious dinner that looks so pretty with out all the effort. In our house it was even easier as a team effort–hubby out on his new birthday grill using his deeply ingrained man-tuition to grill the steaks to perfection (he’s surprisingly good for not having had a grill until a few months ago). Now, the real jewel in this recipe is the pureed cauliflower. I always hear about people trying to replace potatoes with cauliflower and I have never been convinced–until now. It was just like mashed potatoes, it was kind of amazing. I cheated with this recipe a little—I used a bag of “steam fresh” frozen lightly seasoned garlic cauliflower, and it was so flavorful. I also cooked the quinoa my traditional way, as the first time I followed the recipe it was a little crunchy and under done. A few other minor tweaks and this is now a go-to meal for us. It really only takes about 15-20 mins to make, and it’s a good healthy meal for two (multiply the recipe as needed to fit your family size). Microwave the steam fresh cauliflower for the time indicated on the bag (or steam your own fresh cauliflower if you would like to do it that way). After rinsing the dry quinoa, put it in the pan on medium and cook until the excess water absorbs, just a minute or so. Add chicken broth (this always is a 2:1 ratio broth to quinoa) and bring to a boil, stirring constantly. The bring heat to low and cover, allowing to simmer approximately 10-12 minutes. Once finished, I like to remove the lid and increase the heat back up to medium and allow some of the excess liquid to cook off as it makes it a little more fluffy. Once finished, remove from heat and cover to keep warm until serving. Once the cauliflower is finished steaming, put it into the food processor. Cut up the butter into small chunks and add to cauliflower. Add cream and parmesan cheese. Process on high for 30 second intervals until very creamy and no longer chunky. Add salt and pepper to taste (don’t skip this last part). Lightly season your steak with salt and pepper and cook steak until to your preferred doneness. Feel free to do this on the grill, pan, or in the oven. Once done cooking, let the meat rest for a few minutes before cutting into thin slices. Plate your food. 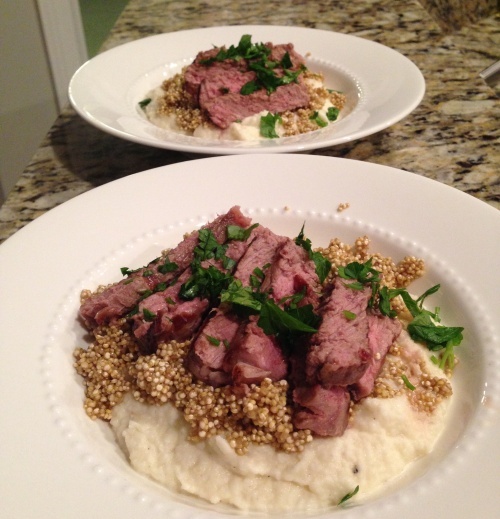 Split the cauliflower puree evenly between two plates, top with quinoa, lay strips of steak on top, and sprinkle with chopped parsley. Enjoy!